This is the BEST LED spoke light for ALL you need! 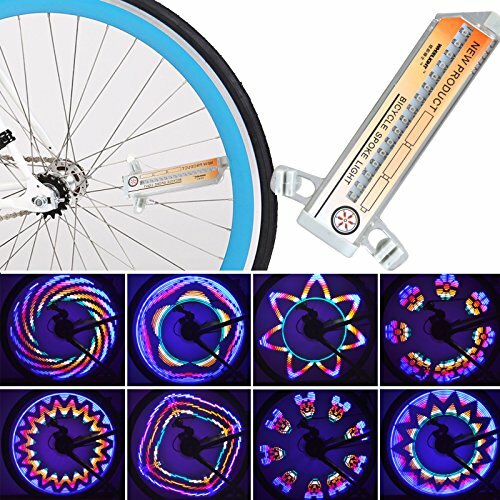 Instead, this kind of wheel spoke light can effectively warn others and makes your bike or MTB super cool and fancy at night that shows your unique personalities. Let's say goodbye to your boring bike! 【DESIGN 30 IMAGES BY YOURSELF】This DIY bike wheel lights, you can download or design some picture from the PC and programming it. You can show what you want on your wheel immediately. It can make your ride more personality. 【SO EASY TO INSTALL, WATERPROOF & SHOCKPROOF】Easy mount and release , installed in seconds before you get ready to ride. Long lasting, safety attached. with Waterproof design, can be used in Rain. 【SUITABLE FOR MOST BIKES】This bike wheel lights can be installed by most of bicycles with spokes, such as rode bike, mountain bike, fixed gear bike and ordinary bicycles. But not suitable for wide spokes bikes & bikes less than 16 inches. If you have any questions about this product by Fashionlive, contact us by completing and submitting the form below. If you are looking for a specif part number, please include it with your message.